Often I lament living in a small city when I discuss shooting in my home town. I curse the lack of action when I’m free to go out and photograph. I curse the difference between my town and larger cities in regards to the amount of people on the street. The truth, I’ve come to realize, is that is some lazy thinking. Living in a small town just means I have to work harder. I have to be more creative. Do more research. However, that being said, living in a small city in Pennsylvania also gives me this: a real sense of wonder when I travel to larger cities or towns in different regions. Frankly, there’s things that go on elsewhere that just don’t happen here. Sure there’s the internet and television that exposes us to different places, but it’s another thing to be in it. This flash mob, is a good example. 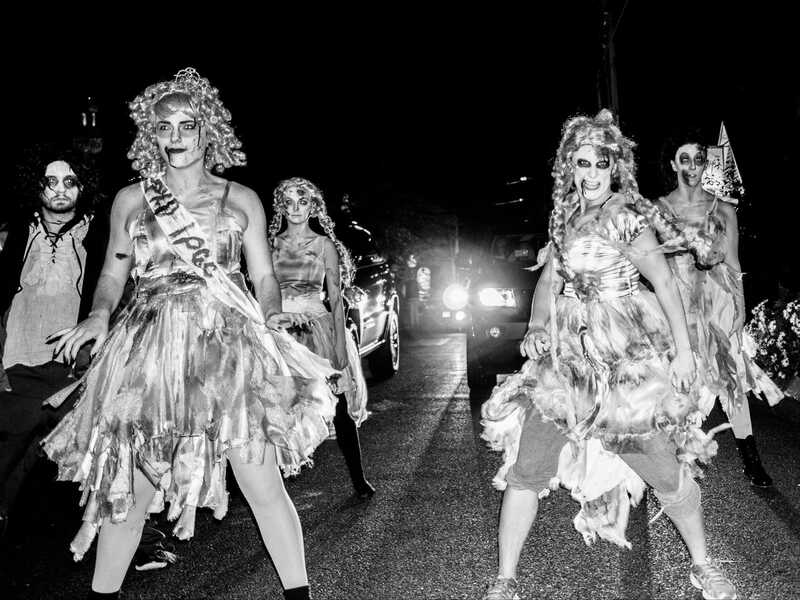 I was in Provincetown on the eve of Halloween and walking the main drag, Commercial Street. It was Friday night and the street was buzzing with activity. I was on the sidewalk, strolling and stopping at shops with my girl, and all of a sudden, I hear Michael Jackson’s ‘Thriller’ start blaring out of a stereo. I looked out into the street and saw people converging and cheering. Here, a group of people dressed like zombies stopped the light, one way traffic on the street and were doing the ‘Thriller’ zombie dance! Now that’s something you don’t see around these parts! I dashed out into the street in front of the mob, and brought the NEX 6 out of the bag. I opened the flash, set to normal, and focused. As I did, someone, who I presumed was associated with the mob, turned on a video cam with a powerful light. I focused and snapped. The combined blast of the video cam light and my flash, along with the backlighting from the car’s headlights made for a pretty cool shot. 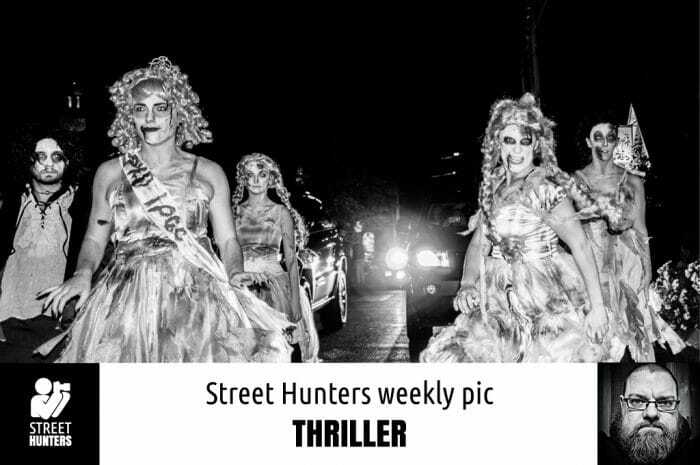 The Street Hunters 2016 calendar is out! Buy it now online!